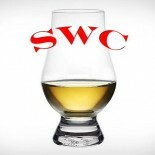 There are those that like to enjoy the delicate side of whisky with quiet, nuanced flavors. There are also those who enjoy a full bodied, more explosive experience when sampling. For the former, I’m so very sorry. 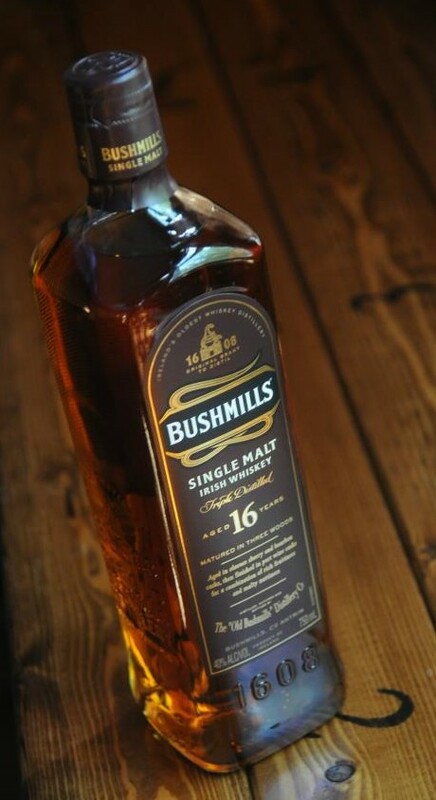 For the latter, may we present to you Bushmills 16yr Single Malt Irish Whiskey. This particular expression has a few distinctions of note. For one, it is a single malt, which is a bit of a departure from the more common malted/unmalted barely combination in so many popular Irish whiskies. Secondly, this malt has been aged primarily in American bourbon oak and Spanish Oloroso sherry oak, finally finishing in Port wine barrels, or pipes. While still triple distilled, as the Irish tradition goes, the malt showcases quite a bit of flavor and intensity, no doubt from the vigorous wood management employed. The result offers quite a bit of intrigue. Nose – Deep fruit notes, ripe raisins/grapes, oaky, nutty, spicy bursts as it opens up. Wine finish pervading everywhere. Irish character still there, but quiet, musky. Taste -Rich and fruity. Vanilla, berry jam, ripe fruits, buttery and clean. Finish – Long and oaky, brandy like sweetness is everywhere, light pepper, liquorice, charred oak. Comment – Big, enjoyable flavors, pleasant and smooth. A solid, oaky whiskey. The wine finish, however, may be a bit too overpowering, hiding the wonderful Irish character we love.